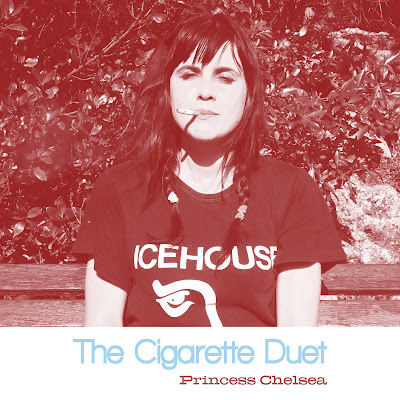 "The Cigarette Duet" is the new single from Princess Chelsea's album Lil' Golden Book and features guest vocals and guitar from Jonathan Brunette. Somewhat of an anomaly on the album - Princess Chelsea ditches the synths and cinematic orchestration and instead dishes up a catchy 60s style pop duet reminiscent of Nancy & Lee. B-Side “Positive Guy Meets Negative Man”, is a more off-beat slightly ridiculous duet with bandmate Brad Fafejta (TeenWolf / Lil’ Golden Book album artist). It’s lyrics are co-written with Brad, and this song first popped as an interlude during early TeenWolf shows. It is also possibly the first song to combine hard-core style screaming with a pretty chamber pop arrangement. You can obtain Cigarette Duet / Positive Guy Meets Negative Man as a single on the Lil’ Chief Bandcamp or on Itunes. We are also pleased to premiere the new music video for Cigarette Duet, featuring an utterly sensual bad-boy guitar solo that rivals Slash’s epic jam in the desert during Guns N' Roses "November Rain" music video. New Music Video by The Eversons!